Original article published at Climate Action Moreland. 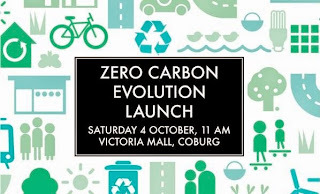 "Zero Carbon evolution is a practical plan for how the Moreland Community can reduce our carbon emissions by 22 per cent by the year 2020. It was developed in a partnership between Council and Moreland Energy Foundation. If we can achieve the ambitious goals set out in this strategy the Moreland community will well and truly be on track to become a zero carbon city and do our fair share to respond to the challenges of climate change. "Council has a proud history of action on climate change and has achieved carbon neutral status for our own corporate operations. We have done this since 2012. The Moreland Energy Foundation has over 13 years of experience at working with the Moreland Community to reduce carbon emissions. Zero Carbon Evolution signals a new era in community action on climate change in Moreland. Council and MEFL working in partnership are committed to work to support and assist the community in reducing their carbon footprint. "I encourage each and every one of you to consider what you can do to play a part in creating a zero carbon city here in Moreland. Maybe it is putting solar panels on your roof, insulating your home or choosing to replace some short car trips with either walking or cycling, but we can all do our bit." Also speaking after Cr Tapinos was Federal MP for Wills Kelvin Thomson who brought some international dimension to the subject saying the real significance at the UN Climate summit wasn't the absence of the Prime Minister but the negotiations and statements from US President Barack Obama and the high level Chinese delegation on climate action. In a critical look at the Abbott Government's priorities Thomson highlighted the disparity between climate change and other security issues, "It is true we are experiencing the effects of climate change, and indeed if the deaths from heatwaves and extreme weather events such as bushfires and cyclones both in Australia and other countries were occurring from other sources: from terrorists or infectious diseases, this would be regarded as a national security crisis and indeed a global crisis." While leadership on climate is increasingly being shown at the international level, "regretably we are not seeing that leadership at an Australian level, whether its the abolition of the carbon price, the attacks on the renewable energy target, abolition of the Climate Commission and the like, we are not getting the leadership we need." Thomson said. Thomson highlighted the strong tradition of concern on environmental issues and climate change in Moreland and that the Zero Carbon Evolution strategy is strongly within that tradition. "One of the things about the debate about the carbon price and the like is it has taken the focus away from the things we can do as individuals to reduce our carbon emissions... It is terrific to see that focus come back on to local action. I support the leadership of Mayor Tapinos and Moreland Council in that regard. I hope that everybody takes the opportunity of being aquainted with the strategy and that we all do everything that we can to reduce our household carbon footprint." Thomson concluded. The third official speaker was Brunswick Labor MP Jane Garrett who said that like on the Federal Level, the Victorian Government under Baillieu and Napthine had wound back significant environment and climate reforms and stopped progress on climate mitigation action in Victoria. "At the Federal Level we have had a disastrous year or so in terms of environmental outcomes", she said, "and that is being mirrored at the state level over these last four years where we have had a real winding back of wind farms, the abolition of solar rebates. We have had an extraordinary attack on National Parks with cows in there, we have had the abolition of our target to reduce emissions - our legislative target - that was abolished." There are positive noises that a State Labor Government, if elected on November 29, is considering the re-introduction of a Victorian renewable energy target, according to comments by ALP candidate for Ripon Daniel McGlone that Environment Victoria responded to in a statement on Thursday. Activating the community to reduce emissions. You can read and download the Zero Carbon Evolution Summary Document and Full Strategy at Moreland Council Reducing the community's emissions. Another useful resource are the pages that we at Climate Action Moreland have put together: Empowering Moreland. Moreland Council are yet to commit to a transition plan to divest their finances and banking from financial institutions heavily invested in fossil fuels, including the big 4 banks. Climate Action Moreland and 350.org are currently campaigning for this divestment commitment. In among the various entertainments members of Climate Action Moreland wandered about collecting signatures for the Monster climate petition and handing out the Vote Climate postcard.